… I stepped out of the office the other day and noticed a befuddled group of tourists staring at a map, turning it around in their hands and pointing at the street names. It looked like they were about to start a very large argument and seeing how i’ve been there so many times with my family I thought i’d step in and ask if they needed help. After staring at me with what looked like very hostile eyes they all began to talk at once… at speed… in Spanish. Eventually one of the group realised the error and asked me very politely if I could point them in the direction of Covent Garden. Our office is very close to the famous piazza so it really wasn’t very hard to send them off on their way, only I looked up and noticed that they were arguing again and then one of them came marching back to me. ‘we are hungry… where should we eat?‘ She said. as you’re probably aware, it’s the blood orange season and I buying them by the sackful because they’re are so incredible. I feel it my duty to inform you that Aldi have knocked it out of the ballpark with their pick this season. I have no idea where they get them from but they are stunning. They have that intense sherbet flavour, sweet and sharp and the colour is breathtaking. If I see a bag I buy 3 and I haven’t had a duff one yet. 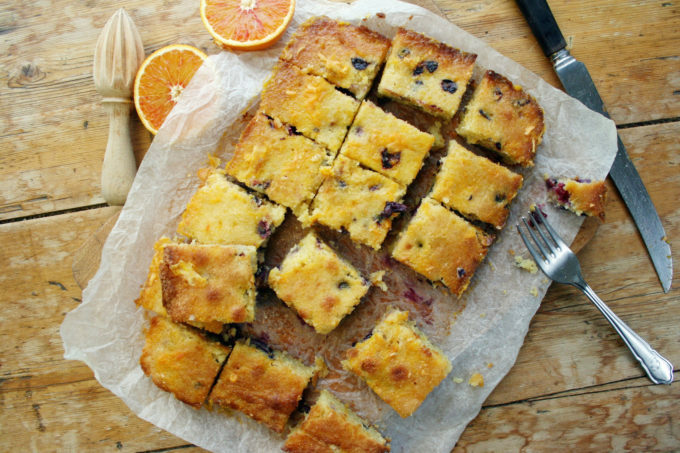 The flavour works really well here in this tray bake, which is essentially an adaptation of a classic lemon polenta cake. You don’t need as much sugar for the syrup because the orange is so much sweeter but they still retain that fabulous tart twang that I adore so much. I’m going slightly mad with the two homes malarky (middle-class problems, I know) but I keep thinking i’ve got stuff in one place that I actually have in the other, so this morning when I woke up convinced I had a bag of fine polenta in the cupboards I was very frustrated not to be able to find it and realising that in fact it’s in the London flat. So I made this cake work with the dregs of the bag of polenta and to keep it gluten-free, a bit if Dove’s Farm regular flour mix. line the base of a 30cm x 20cm baking tray with baking parchment and grease its sides lightly with butter. in a mother bowl, mix together the almonds, polenta and baking powder, then once your butter and sugar is pale and fluffy beat some of this into the butter-sugar mixture, followed by 1 egg, then alternate dry ingredients and eggs, beating all the while. 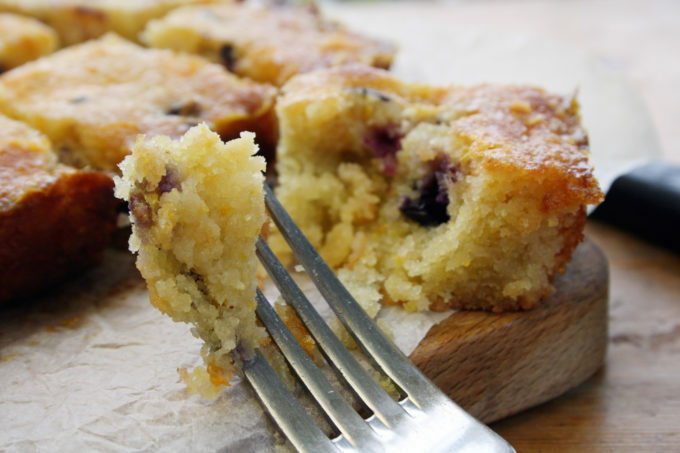 finally, beat in the lemon zest and blueberries – rigorously so as to break up the berries and then spoon the mixture into your prepared tray and bake in the oven for about 25-30 minutes. Remove from the oven onto a cooling rack but leave it in the tin. make the syrup by boiling together the orange juice and icing sugar until the sugar has melted then prick the top of the cake all over with skewer and pour the warm syrup over the cake. Leave to ‘just’ cool before taking it out of its tin and try and eat a cube or two whilst it’s still warm… you won’t regret it. That looks moist and delicious! Thanks! That’s a shame, I think it must be hard to tell. i bought 3 nets from Aldi (in Louth) and they were all incredible. Some were dark dark blood red and some were normal with a few red speckles. One out of 24 oranges was just orange! This is utterly glorious Dom and such a clever recipe using the season’s first blood oranges too! 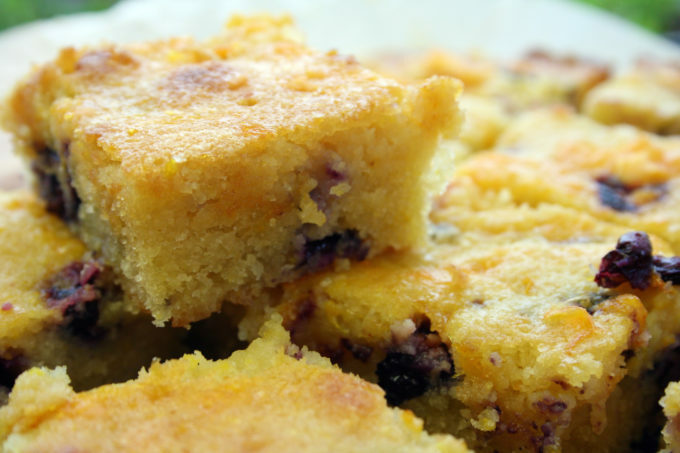 I love tray bakes like this – so easy to make and yet so delectable to eat! Can’t get enough of blood oranges either! They are just this week opening a new Aldi where I live….. I will have to go look! oooh a new Aldi… to exciting! Thanks Kellie… they are my favourite orange! That looks moist, delicious and in need of me eating it! 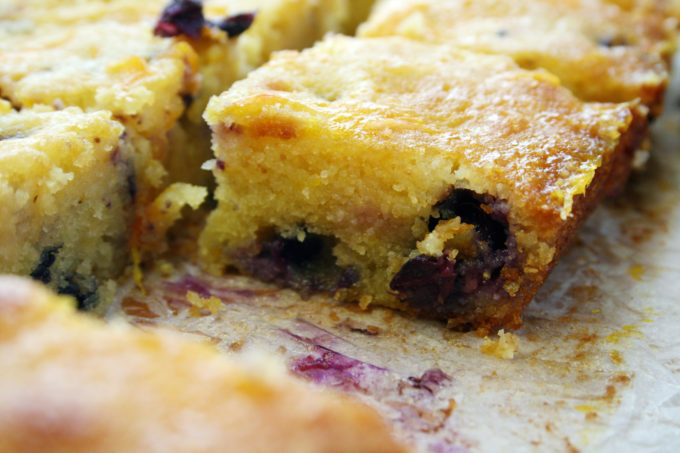 Whatever you used to make this traybake, it looks absolutely perfect and sounds even better. Blood oranges are such a treat.